This site is dedicated to railroading. It contains a good collection of photographs that I have taken since 2000. 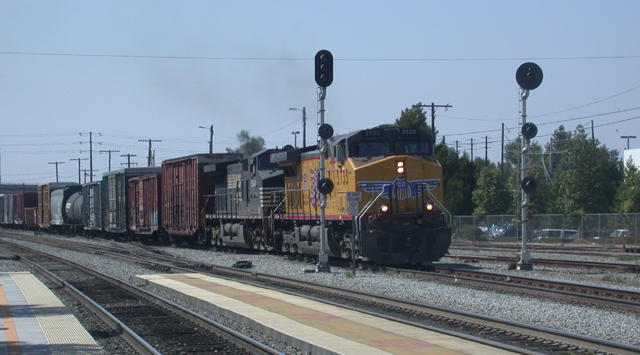 A heavy emphasis is on Union Pacific�s Coast Line including San Luis Obispo, Cuesta Grade, and the San Jose Bay Area. There area also photos from other areas of California and the county. This site also contains a model railroading section and a section of train gif railroad related art. My goal is to add a railfanning section with some guides to at least the greater San Luis Obispo Area, and maybe the Bay Area also. This may still be a ways off. Thank you for visiting and I hope you enjoy yourself. Ok, so I�m not good at making official updates. Nothing new there. The links page is still in a very incomplete state. Someday that will get fixed, but with my limited time that has not been a priority. The photo pages have my most recent shots, but still need a few more added to bring them fully up to date. The other big project for the site that is currently in the works is a railfan guide type of a thing to the San Luis Obispo area. This is still in the very early stages, and I will be honest and say it will see little if any work till this summer, and may not be up till late 07 or even early 08. School and work have a way of taking a lot of time. As always check back for updates� both official and unofficial. I have a way of being lazy and not updating the front page when I add new photos. If anyone uses A.I.M. my screen name is "toothpickmatt" if you would like to contact me that way. All material Copyright � 2000-2007 Matt Batryn. All rights reserved.